Earlier today we published a post featuring five key Google Scholar features every teacher should know about. Besides these features, we are also adding this useful Chrome extension called ‘Google scholar Button’. This add-on allows you to easily access Google Scholar from any webpage you are browsing. You can simply highlight the title of the article you are interested in and click on Scholar Button to find links to its full text. This Chrome extension is very helpful and will definitely save you so much time. If you run your search query on Google search engine, you can simply click on Scholar Button to transfer your search to Google Scholar. 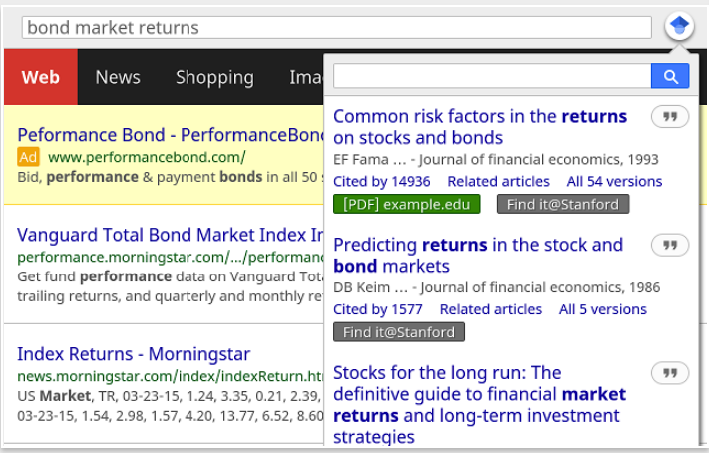 For articles that have similar titles, those with most citations are displayed on top. Additionally, Google Scholar Button also enables you to generate formated citations in different styles including MLA, APA, Harvard, Chicago and many more. You just ‘press the quote button in the popup to see a formatted reference and copy it into the paper you're writing.’ As for library links, you need to make sure you have added the library of your institution to your Google Scholar account (you can learn how to add it from this page). “To search the US case law, click the gear icon at the bottom of the popup, and configure your preferred collection in Google Scholar Settings”.